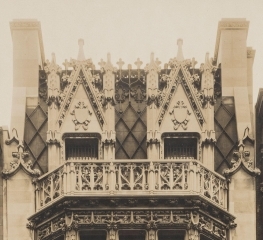 Balcony and dormers donated to the Brooklyn Museum by Mr. Alfred H. Lawrence, 1969. Transferred to National Building Arts Center, 2008. Text from The Architectural Record 29:4 (1911 April), pp. 289-300. 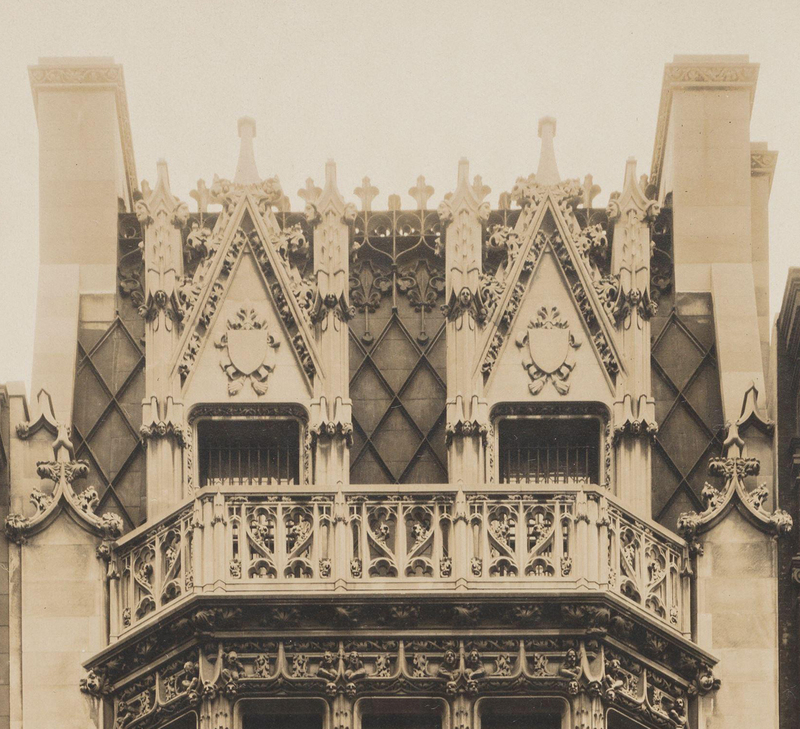 “Nothing great was ever achieved without enthusiasm,” and justly can we apply the above to this masterpiece of Gothic design, whose every line and every bit of carving fairly bespeaks the artist’s love of his subject, and, what is more unusual to-day, reflects the feeling that guides the artisan’s hands in carrying out the master’s conception. The finished product impresses the passerby with the consciousness that master and artisan worked in harmony, dispensing with specifications, authorities and all modern commercial impediments and drawbacks, and, like the men of old, whose only thought was “build thou for pleasure, paint, or sing or carve the thing thou lovest, though thy body starve,” donned their blouses and worked together, infused with the same enthusiasm. “No man can quite exclude the element of necessity from his labour. No man can quite emancipate himself from his age and country, or produce a model in which the education, the religion, the politics, usages and arts of his times shall have no share. Though he were never so original, never so willful and fantastic, he cannot wipe out of his work every trace of the thoughts amidst which it grew”; yet, hampered by conditions which they have had to accept, the architects of this masterpiece have boldly departed from the conventional, with this charming result, that is, at one and the same time, particularly distinctive and thoroughly logical. One cannot but admire this fine combination of abandon and restraint; the former displayed where freedom was allowed to have its sway and controlled immediately when and where that finer sense of feeling demanded restraint. Like the tree in a forest of rank undergrowth, almost choked, and with scant space in which to develop, this design has grown up. limb out of limb and branch out of branch, expanding as much as it could in its environs. Springing from its base or first story, which is treated so severely, accomplishing the desired impression of strength without any effort, with its many limbs forced in their early stages to grow straight upward, it rears its full height, branching out into innumerable little twigs and leaves of ornament, and finally becomes perfectly developed. Restricted as they were within the limits of an ordinary city lot, the architects, by their happy disposition of plain and ornamented surfaces, have, to a great extent, succeeded in overcoming the feeling of confinement. Although all the vertical lines of the composition, which naturally tend to give the impression of narrowness to the mass, are accentuated; yet, by the excellent treatment of the pylons which are kept perfectly plain, and by the massing of the ornament on the central bay, held in by these plain surfaces, the feeling of greater width is obtained and ties the whole into a perfect unit. Structurally speaking, the design is very sincere. What more frank than these plain surfaces extending up on either side, suggesting the buttress (one of the salient features of this style), which expresses the main walls of the building! What more logical than the large space between, filled by the three-story bay and pierced by five windows on each floor, and otherwise covered with exquisitely carved detail, which tends to lighten the entire mass! One unconsciously feels how delightful must be the rooms back of this ornamented grille of stone and glass. Too much praise cannot be given the man who conceived these effects, for his treatment of the roof. This part of a design is too often given more prominence than it deserves or is conventionally expressed as a roof. 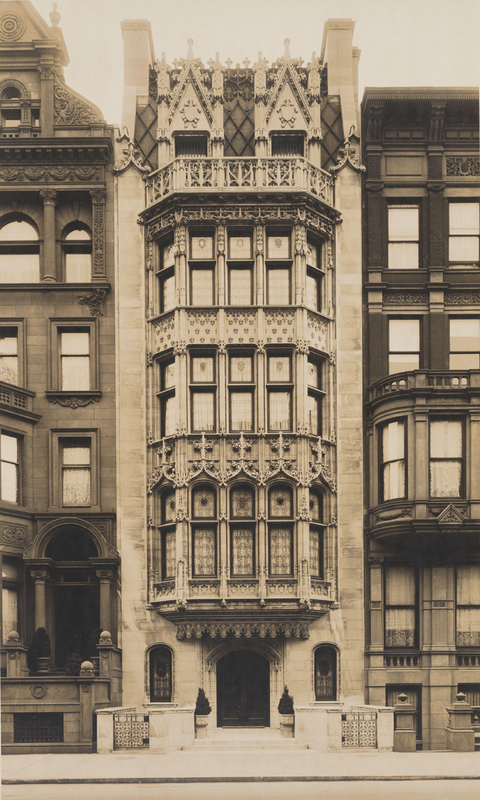 In this instance, however, the two are combined by the masterly conception of the two dormers, which in themselves are gems, instead of the more obvious employment of one large one, and by the delightful lozenge patterns in copper covering the plain surfaces, which are terminated in a wealth of ornamental detail. In detail, and especially in commenting on the ornament, it can be said that “if the ornament does its duty—if it is ornament, and its points of shade and light tell in the general effect—we shall not be offended by finding that the sculptor in his fullness of fancy has chosen to give much more than these mere points of light, and has composed them of groups of figures. But if the ornament does not answer its purpose, if it have no distant, no truly decorative power; if generally seen it be a mere incrustation and meaningless roughness, we shall only be chagrined by finding when we look close that the incrustation has cost years of labour, and has millions of figures and histories in it and would be better of being seen through a Stanhope lens.” So the eye that brought this into being never lost sight of its architectural purpose. “Not a leaflet but speaks, and speaks far off, too; and so long as this be the case, there is no limit to the luxuriance in which such work may be legitimately and nobly bestowed.” Work, however, may be wasted by being too good for its material, and also the converse is true, which is more often the case in our times. But, here again, the architects have chosen old blue hole stone (such as was used by the late Richard M. Hunt in a gem of his in this city), and which has no end of possibilities, not only in colour, but texture, and is admirably adapted to this exquisite carving modeled by the master architect himself, the undercutting of which is superb. Each cusp figure and leaf portrays that enthusiasm and love, which only reveals itself when author, design and material are in accord. Special mention should be made of the leaded glass work with the rich painted medallions. The architects were fortunate in being able to employ the use of it for all the glass. Designed and executed in harmony with its surroundings, it puts the finishing touch on an already beautiful work of art. As to the interior: In general, there is not much latitude given in the planning of the city house. The individuality of the owner, therefore, is not as evident in the arrangement of his interior as in the furnishing of the different parts. In the case of the planning, the architects have shown the same care and study that mark the exterior. Herein lies the difference between this house and many of the modern New York dwellings. Often the rooms of these houses are only decorated, but in the present instance they have been designed, as the accompanying illustrations will show.